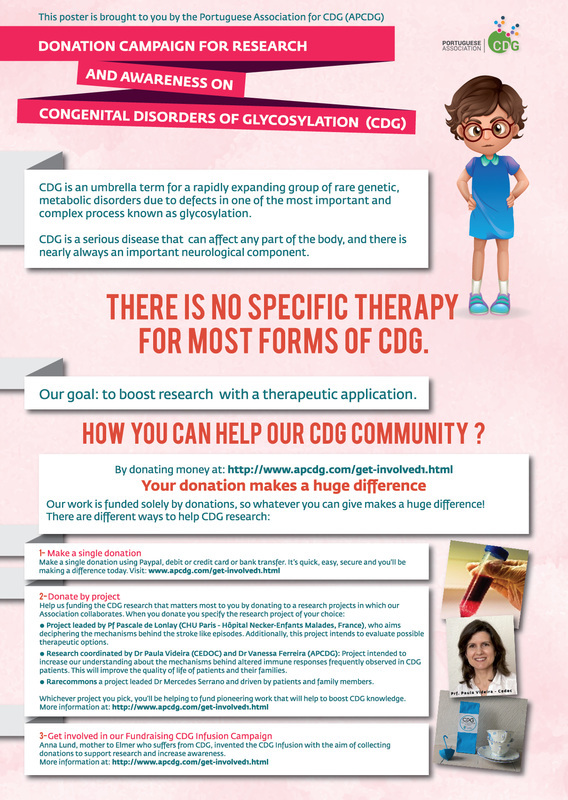 How you can help CDG community ? The APCDG-DMR is leaded by affected family members that volunteer in an altruistic manner.We do not receive government funding. We rely solely on donations in order to continue our projects. Thus, we know how to do a lot with very modest budgets. However, we still need your donation contribution to help us do our work. Make a donation using Paypal, debit or credit card or bank transfer. Your donation will help fund advocacy efforts, awareness, education and research. All details are found below. If you wish further information, please write us at: sindromecdg@gmail.com. Read the poster on the right and learn how your donation makes a huge difference in our patients and families lives. Using Paypal, debit or credit card. Go to DONATE bottom found below and follow the instructions. It’s quick, easy, secure and you'll be making a difference today. Please note, when you use Paypal system, once the payment is performed an automatic email confirming the payment is sent to you and to our organisation (APCDG-Associação Portuguesa CDG e outras Doenças Metabólicas Raras). ​Or performing a bank transfer; the account details are found below. Project leaded by Pf Pascale de Lonlay (CHU Paris - Hôpital Necker-Enfants Malades, France), who aims deciphering the mechanisms behind the stroke like episodes. Additionally, this project intends to evaluate possible therapeutic options. Research coordinated by Dr Paula Videira (CEDOC) and Dr Vanessa Ferreira (APCDG): Project intended to increase our understanding about the mechanisms behind altered immune responses frequently observed in CDG patients. This will improve the quality of life of patients and their families. Rarecommons a project leaded Dr Mercedes Serrano and driven by patients and family members. Diagnosis of suspicious CDG samples using Transferrin isoelectrofocusing (Tf-IEF), a widely used to screen for Congenital Disorders of Glycosylation (CDG): this project consists in funding this screening technique. It is done in collaboration with Dr Dulce Quelhas . How to support a specific research project? Using Paypal, debit or credit card. Go to DONATE bottom previously available and follow the instructions. It’s quick, easy, secure and you'll be making a difference today. Please note, when you use Paypal system, once the payment is performed an automatic email confirming the payment is sent to you and to our organisation (APCDG-Associação Portuguesa CDG e outras Doenças Metabólicas Raras). Why become a member? The APCDG provides services that support the continuous exchange of experience and knowledge of our community through educating, informing and linking the families and professionals globally. Membership dues: minimum 10 euros annual membership. Be a volunteer: We appreciate your desire to volunteer with the APCDG. Your work will be recognized. We provide different Volunteering Certificates to certify your voluntary work: Bronze for achieving 25 hours of volunteering, Silver for achieving 50 hours of volunteering and Gold for achieving 100 hours of volunteering. Please contact us at: sindromecdg@gmail.com and request our Volunteer form. Please request at sindromecdg@gmail.com a Volunteer Form if you are interested in participating in any of our committees. Fundraising events benefit our organization greatly, as the APCDG survives solely on the generosity and donations of our members, friends and family. Please spread the word about CDG. Be creative! How? A simple email to spread the word can go a long way! Purpose an activity. We can support you with resources such as slide kit tools.